Hebna specialises in compressed-fit high-density polyethylene (HDPE) internal pipeline liner installation, pipeline rehabilitation and plastic pipe systems. The installation of HDPE liner pipe through trenchless technology is the time-tested best solution for the prevention of pipeline abrasion or corrosion. The development of high-performance polymers used in the process of making HDPE liner pipe have come a long way. HEBNA uses bimodal polyethylene HD RC resins that provide excellent resistance to slow crack growth and rapid crack propagation. For raised temperatures up to 203°F or 95°C, HD RT resins offer complete protection for high temperatures, aggressive chemicals and highly oxidative conditions. Offering a superior form of pipeline maintenance and protection, Hebna’s compressed-fit liner provides a product that is particularly well-suited for protecting your pipeline investments that handle tailings, concentrate, acid lines and PLS. In addition to the obvious maintenance benefits of abrasion and corrosion resistance, compressed-fit HDPE liner systems may also satisfy secondary containment requirements for pipelines through environmentally sensitive areas. The compressed-fit liner systems have been used as a cost-effective method to satisfy dual containment requirements. Experienced corrosion engineers say that inserting a compressed-fit HDPE liner is the best way to guarantee a zero-leak solution. To this end, it is no surprise that facility or corrosion engineers are increasingly opting for dual-containment systems, especially when pipelines are in proximity to environmentally sensitive waterways. Engineers are protecting new construction from internal corrosion or abrasion from the beginning, which consequently decreases pipeline maintenance costs. Compressed-fit HDPE liner pipe can be used in a number of applications where a long service life is desirable. HDPE liners are used extensively in almost all pipeline applications including chemicals such as acids, alkalis and salts. HDPE liners are a durable, cost-effective way of meeting your long-term goals in which internal corrosion or abrasion is an issue, including high-pressure large-diameter pipelines. 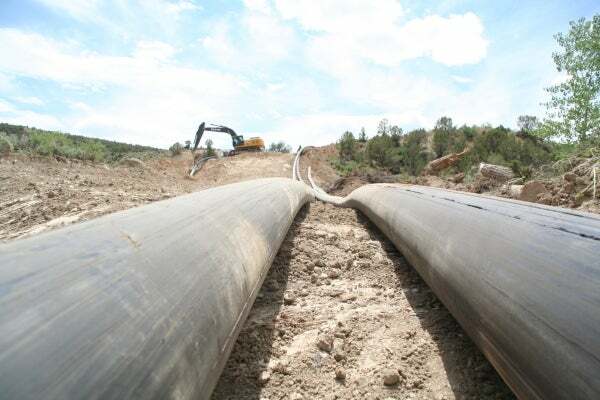 Pipeline operators for more than 25 years have benefited from internal HDPE liners by rehabilitating existing small and large diameter pipelines that have suffered from internal corrosion or abrasion. Internal HDPE liners may also provide an increase in flow capacity. The bridging properties of HDPE may enable operators to return their aged pipeline to full operating pressure. Pipeline owners and operators count on Hebna to provide the most advanced materials and installation techniques for HDPE liners. Lower capital costs due to longer pipeline life plus lower maintenance costs equals high-value investment. Overall, the non-corrosiveness and abrasion resistance of HDPE plus the strength of the steel extends the life of pipeline assets. Hebna’s safety programme and credentials are monitored in real-time through PEC, Complyworks, Browz and ISNETworld. HEBNA will have a display at the Global Petroleum show in Calgary, Alberta, Canada, from 10 to 12 June. HEBNA specialises in a compressed fit high-density polyethylene (HDPE) internal pipeline liner installation, pipeline rehabilitation and plastic pipe systems.